It’s a shame then that as Choose Your Destroyer strike their first chord it‘s fairly empty and the crowd seems half asleep. They immediately set their stall out though; a mash up between SikTh, Lamb of God and Faith No More. Vocalist Adam Philips cycles through the full range of deranged Mikee Goodman voices, guttural Randy Blyth growls and full-blown Mike Patton showman singing. The instrumental, and specifically guitar work, shifts between those influential bands clearly as well. Craig Bussey on guitar allows himself some engaging Living Colour-esque solos for good measure too. The variety of influence works well because the vocals and guitar in particular switch seamlessly between the styles, arguably exemplifying each along the way. A chat with Philips after their set confirms my inkling that they're using a click-track to supplement keyboard parts and sung harmonies. It shows how tight they are that it’s not that noticeable on stage that they're doing this, and truthfully it’s an excellent way of ensuring the superb song-writing is suitably enhanced live. Philips also reveals that they've not been together that long as a band, and are fundamentally established musicians from other West Yorkshire bands looking for an enjoyable musical outlet. That ethos shows too, as they have infectious energy on stage. Choose Your Destroyer deliver a satisfying balance between brutal, funky and djent influenced metal. I’m genuinely excited to see what this Bradford quartet can do in the future - keep your eyes on them. Defences are best described as an homage to Of Mice & Men. They have a female clean vocalist and elements of Bury Tomorrow, but at the core this is for Of Mice & Men fans. Whilst there’s an undoubtedly powerful drum sound, it really is all vocals and drums on show here as it’s so difficult to discern anything else. The violent beatdowns are good, but the guitar and bass have too much mid-tone and come across mushy sounding. Some of Defences songs are quite catchy, but I'm not sure I'll remember to check them out once I've had a few pints and left the venue. 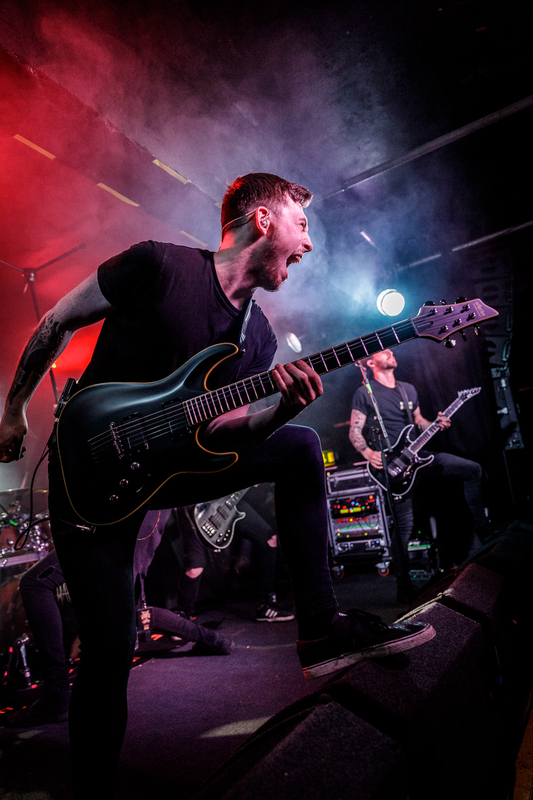 The coarse vocals are clearly influenced by Sam Carter from Architects and, together with the technically solid drumming, are the only real stand out aspects; the drums almost play out a rhythmic melody of their own which the sporadic coarse vocals enjoyably embellish. As I think I’m warming to them they unfortunately all of a sudden enter into a drumming interlude, then the stale ‘get down low on the floor' shtick, before trying to get each half of the room to do singbacks. I want to like Defences, and the songs often start promisingly, but all too soon stall as they still need to hone their musical craft and reduce their reliance on gimmicks. The Raven Age finally take to the stage and the baying crowd lick their lips with glee. Unfortunately, for this reviewer at least, I'm left massively unimpressed by what I'm presented with. The Raven Age seem to revel in being a very poor imitation of Black Veil Brides. If this seems a tad harsh or unfair, then give their track ‘Fleur de lis' a listen and come back to me. The frontman is a towering glam-metal presence, but his vocals are exceptionally thin and nasal, though he can hold a note and doesn't over do the vibrato which can be a mistake with this style of singing. There are moments when The Raven Age tease that they’ll dip into something grittier and more akin to Avenged Sevenfold, most notably when the guitars do demonstrate some clarity and harmonize well, but this is too often a false dawn. What I will say is that they have the right image to go with the music, and a large portion of the crowd are really enjoying them. In fact there’s a lady right at the front who is living every single moment, she’s so caught up in the moment that her outstretched hands and face are pushed almost into the bass players pickups. I think The Raven Age are definitely a good example of how musical enjoyment can be so diverse and relies on subjectivity. To be honest I do believe other bands perform this genre better, but if you really do love this exact style of act within this genre then these guys might be a good way to spend an evening.